Norene... you're making this difficult!!! I've read a lot of how-tos for breaking through brick walls, but nothing that will help me with Norene. It's almost as if Norene prefers to remain anonymous. I've dealt with ancestors that, for various reasons, have situations that make them hard to track, but Norene has not one, not two, not three, but four things working against me, all at the same time. First, Norene was not her given name. It was actually Molly Norene. She occasionally went by her first name, but more often went by her middle name. Sometimes she was Molly, sometimes Mollie, even Molley, sometimes Norene, Norine, Noreen, and I've even heard her referred to as Maureen. Second, she was married at least three times. And her husbands all had common surnames! Her maiden name was Henard, but she married a Hall, a Vinson, and a Madsen. Combine that with the possible first names used, and we have a mess on our hands... I have no idea of the first names of these men, except Victor Hall, or when or where they married or divorced. Third, she moved around a lot. Texas, Colorado, several locations in California, back to Colorado, Wyoming, Utah, back to Colorado... Uff-da! I'm getting tired just thinking about it! Fourth, lack of much family knowledge about her. She had one son, who moved around a lot. The son had a daughter (my DIL), who didn't know her father well, and her grandmother even less well. Norene's next closest relatives would be her sisters' children. The sisters were married numerous times too, so I have no idea who the nieces and nephews are. The only way I've been able to piece together what I know is from documents of others around her. Her son's birth certificate refers to her as "Mrs. Molly Hall." Her mother's obituary refers to her as "Mrs. Norene Vinson." When her son joined the military, his records showed her as "Molly Norene Vinson" and by the time he was discharged four years later, she was "Molley Norene Hall". When she died in 1987, she was Norene Madsen. I have been fighting, begging and jumping through hoops with the State of Colorado for her death certificate, to no avail, and cannot find anyone in Bent county, Colorado who can look for an obituary for me. I may end up driving the 900 miles myself to get it, and with my luck, it still won't tell me what I need to know. Weighing nearly 10,000 tons, the "Oscar II" cut through the waters of the Atlantic ocean at a speed of 15 knots, with over 1,000 passengers on most of her voyages. 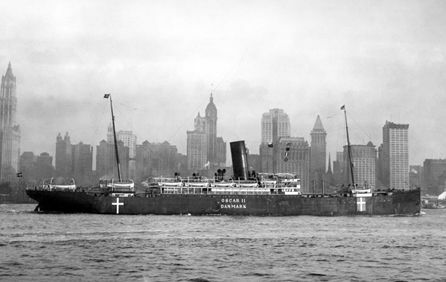 She hauled thousands of Scandinavians from Europe to their destinies in America, until she was scrapped in 1933, after 32 years of service. Among those Scandinavians looking for a better life were my grandparents, Adolph Hammer and his young wife, Agnes, and their 11 month old daughter, Mary. I've often wondered how Agnes must have felt on that trip. Aside from being 7 months pregnant, and tending to a young child, I wonder if she was excited about their prospects in a new country? What did she think of the spectacular New York skyline - did they, in some imaginative way, remind her of the fjords of Norway? Was she was homesick for her father, mother and brothers? Was she afraid she'd never see them again? (She didn't.) When she dreamed of their future, what did she envision? Hello! I'm Karen, a "50-something" located in the Land of 10,000 Lakes. I'm a lab technologist by day, and by night, well, a house-cleaning, dinner-cooking, webmaster, family historian, blog-author, baseball-watching, facebooking grandma. Leave me a comment and say hello - and thanks for stopping in!! 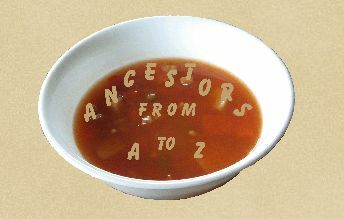 © 2010 by Me, Karen, Blog: Ancestor Soup. You may NOT reproduce any portion of this blog without the express written permission of the author/blog owner. All posts copyrighted by Karen, 2010. Do not reproduce without permission. Watermark theme. Powered by Blogger.